Swain covered boarded up windows of a 1909 electrical substation building in Boston with giant photos of furnished rooms. Swain made this miniature city from scraps of Belgian block and brick. It's only visible at low tide. 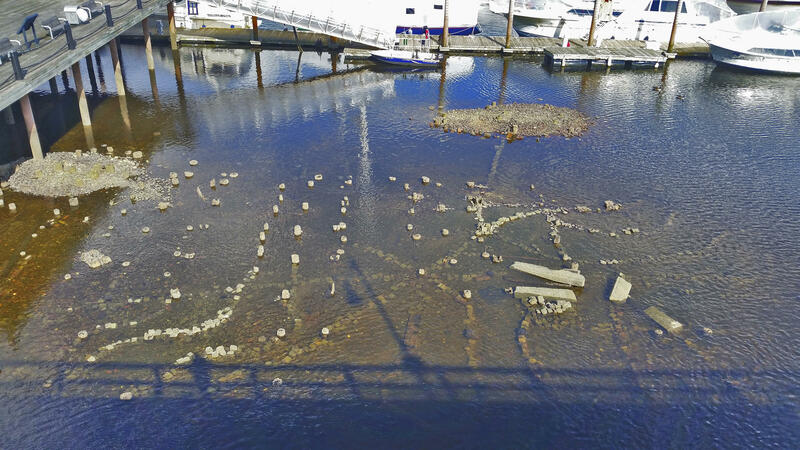 He wants viewers to imagine the effects of sea level change on Boston. 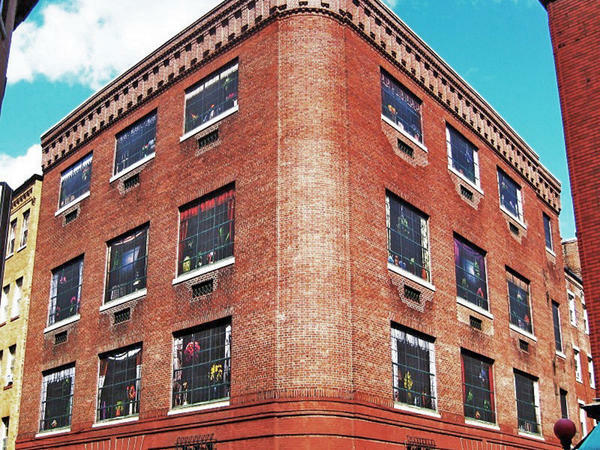 "It's a mystery," says Emily O'Neil, executive director of the Fort Point Arts Community, a group of artists who've long occupied the old warehouses in the neighborhood. "When we first saw it, the reaction from the community was literally, 'How wonderful, guerilla art has come back!' "
One day, I came across an Instagram picture of the Lego patch — in pieces. That's when I found Nate Swain, a former landscape architect trying to make it as an artist. "I saw this gaping hole in the wall ... and it was just sort of having fun with what most people would consider a problem," he says. Swain swept in and did it under the cloak of darkness late one Sunday night, and ever since he has been privately giggling at his very public joke. But more recently, Swain — a former landscape architect who quit his cubicle to try to make it as an artist — started having second thoughts about his anonymity. He agreed to go public with this story. 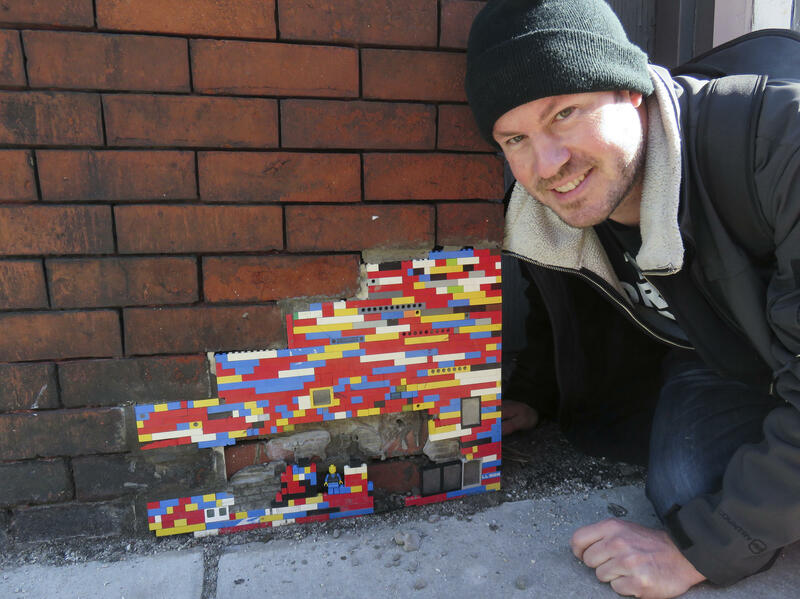 It turns out Swain has pulled his jokester genius all over the city — the Lego patch was not his only project. He has covered boarded-up windows with giant photos of furnished rooms. He has scaled down a 20-foot wall into the Fort Point Channel to build an underwater surprise that you can only see when the tide goes out. "I just wanna make people laugh and maybe question," he says. "If you catch their eye and snap them out of their consensus trance that they're in and make them just think ... that's what I really wanna do." Like most of his work, Swain says, the Lego patch was part prank and part political commentary. It was meant as a nod to the neighborhood's need for a police station and to the building boom's squeeze on local artists. Swain says he'll find ways to keep planting pops of color, joy and jokes in surprising nooks around the city. Hoping to boost his career, he says, he will now start marking his work so people will recognize it as his when they see it. His friends call it Swain-spotting. Hear the full story about the mystery and reactions to Nate Swain's art by clicking on the audio above. SMITH: ...Tovia Smith, NPR News. Transcript provided by NPR, Copyright NPR.